John G. Nicolay was born February 26, 1832, in Essingen, Bavaria; immigrated to the United States, 1838; died September 26, 1901, in Washington, DC; son of John Jacob and Helena Nicolay; married Therena Bates, June 15, 1865 (deceased, November, 1885); children: one daughter, one son (died as an infant). 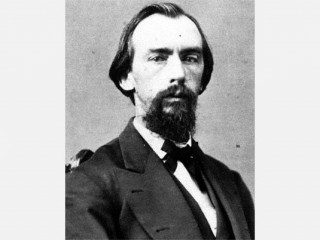 Best remembered as one of President Abraham Lincoln's two private secretaries, John G. Nicolay gathered information during his service in the executive mansion that he later used in writing, with fellow secretary John Hay, the bestselling biography of the president, Abraham Lincoln: A History. The pair were unable to gain access to Lincoln's private papers until 1875, at which time they commenced writing the multivolume biography, which took fifteen years to complete. The biography focuses on the political and administrative history of Lincoln's years in office and only touches lightly upon the martyred president's private life. Some critics regret this absence, for Nicolay and Hay were in constant contact with the president and could have left a more revealing record of the unofficial Lincoln. Nevertheless, the biography is generally regarded as comprehensive, clearly written, and accurate, even if too respectful toward Lincoln. Government official, journalist, and writer. Free Press, Pittsfield, MA, began as typesetter, became editor and owner; served as a marshal with the U.S. Supreme Court and as one of President Abraham Lincoln's two private secretaries. Also worked as a store clerk, White Hall, IL. * Abraham Lincoln, Little, Brown (Boston, MA), 1882. * The Outbreak of Rebellion, C. Scribner's Sons (New York, NY), 1885, reprinted, Longmeadow Press (Stamford, CT), 1996. * (With John Hay) Abraham Lincoln: A History, The Century (New York, NY), 1890, reprinted, 1917, abridged edition, edited by Paul M. Angle, University of Chicago Press (Chicago, IL), 1966. * The Outbreak of Rebellion, C. Scribner's Sons (New York, NY), 1881. * A Short Life of Abraham Lincoln, The Century (New York, NY), 1902, reprinted, 1930. * A Short Life of Abraham Lincoln, Condensed from Nicolay and Hay's Abraham Lincoln: A History, The Century (New York, NY), 1903. * (Editor, with John Hay), Abraham Lincoln: The Complete Works, The Century (New York, NY), 1894, new and enlarged edition, Tandy-Thomas (New York, NY), 1905, original edition reprinted, The Century (New York, NY), 1922. * An Oral History of Abraham Lincoln: John G. Nicolay's Interviews and Essays, edited by Michael Burlingame, Southern Illinois University Press (Carbondale, IL), 1996. * With Lincoln in the White House: Letters, Memoranda, and other Writings of John G. Nicolay, 1860-1865, edited by Michael Burlingame, Southern Illinois University Press (Carbondale, IL), 2000. Also author of Lincoln's Personal Appearance (New York, NY), 1870-1930; Lincoln, Abraham (1809-1865) (Cambridge, England), 1910-11; and Lincoln's Secretary Goes West: Two Reports by John G. Nicolay on Frontier Indian Troubles, 1862, edited by Theodore C. Blegen, Sumac Press (La Crosse, WI), 1965. Contributor to published edition of Lincoln's Gettysburg Address ..., The Century (New York, NY) c. 1894. The author's papers and manuscripts are housed in the Library of Congress. View the full website biography of John G. Nicolay.